Although Malachi was due in May, I joked that he would come in April, because I know so many people born in April. My sisters. My parents. My mother-in-law. Several aunts. But I was thinking end of April. April 6 - My sister (his Nanty) Candace's birthday (and was my paternal grandfather's birthday). April 7 - My dad (his grandad's) birthday. Something you should know about me, if a thing interests me enough, I will research it to death. And when we found out I was pregnant nothing interested me more than finding the right provider. I knew from the very beginning that I wanted to work with a midwife. Midwifes tend to have that extra special touch that first time moms are especially in need of. I wanted a home water birth with a midwife, but Danny worried about possible complications. So we compromised. I would still work with a midwife, but it would be a hospital birth. After looking at all the information, I decided on See Baby Midwifery, which works with Atlanta Medical Center (AMC). AMC is an older hospital (but honestly, I had nothing to compare it to). Still, I kept hearing and seeing that, in general, the staff in the labor and delivery unit was more pro-unmedicated childbirth than some of the other hospitals in the area. They also did water births. 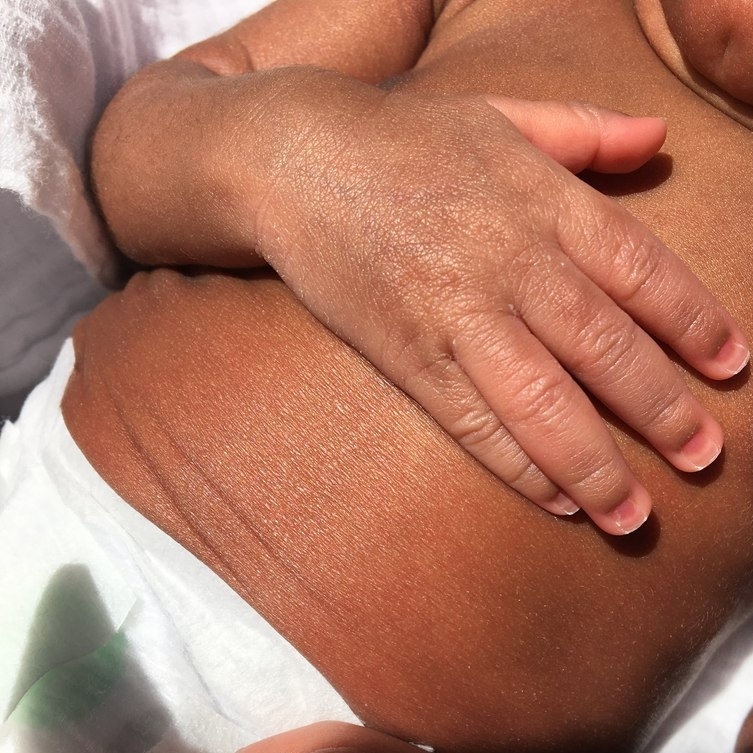 See Baby had rave reviews, especially Dr. Bootstaylor (the head of the practice), who specializes in complications and high risk pregnancies as a perinatologist. When we first went to See Baby, the practice was in transition. To be completely honest, our first visit with one of the midwives, who was new at the time, felt cold and clinical. I was more than a little disappointed. But with each visit, things gradually got better. In the end, I had an amazing delivery experience and had the unmedicated birth I wanted. I did not get to attempt a water birth because I wasn't full-term (at least 37 weeks). JESUS - I wholeheartedly believed this was something HE wanted me to experience so I could truly know with Him I can do all things. Determination - to keep things as uncomplicated for baby as possible. ALL interventions have risks associated with them and since Malachi was already so early I wanted to avoid putting him at further risk. My supportive birth team - Danny, my mother, my mother-in-law, a phenomenal midwife - Kay, and the experienced AMC nurses. I went to bed at 3am (insomnia, remember?). I was up, bright and early at 6am. I sat up in bed when Danny got up and about 8:30a I felt the baby move and literally heard a pop and then felt the water running down. I jumped up and went into the bathroom to tell Danny, because "Oh crap I think my water just broke, and ewww don't get it everywhere" (lol). Danny who is ever Mr. Cool calmly sprung into action, and told me to get ready so we could go to the hospital. I got in the tub, and started making calls. We got to the hospital about 9:30a. When we were in the triage room, I was still leaking amniotic fluid, because apparently I had a slow leak. I was more than half-way to full dilation, and contracting every 4 to 5 minutes, even though I couldn't feel the contractions. I was in active labor. Dr. Bootstaylor came in and went through our options—go home at the risk of a having baby at home or on the way back (since I was already so far along); and if I chose to stay, would I receive antibiotics via IV since I never got around to doing some tests (which had been scheduled for my next prenatal check up). 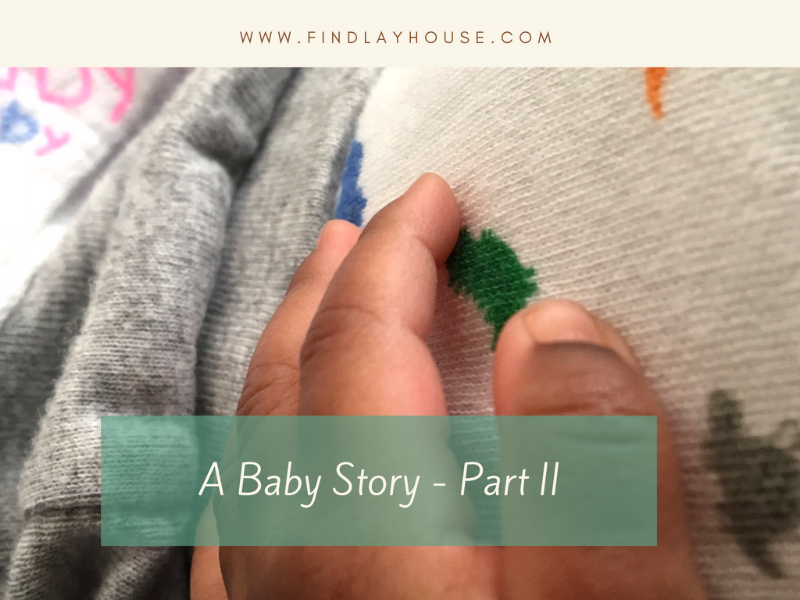 We opted to stay of course and I declined the IV with the understanding that if there seemed to be a problem with baby after he was born, he would require a full and extensive work up. I got moved to a labor and delivery room. Kay, the midwife, came in to check on me. And after getting settled, I walked the halls of the unit with mother-in-law to encourage more progress. Any time I was in bed there was fetal monitoring to ensure baby wasn't in any distress. By the time my mother got to the hospital that afternoon the adrenaline had worn off and the exhaustion had set in. The calm before the storm. Exhaustion still evident. I managed to eat a big dinner in the evening. I was hungry! When the night nurse, Andrea, came on, she walked the halls with me. Finally around 11pm I tried to get some sleep. It was a contraction that jolted me from my sleep around 2am Sunday morning. I closed my eyes and tried to fall back asleep but a few minutes later there was another contraction. Rather than fight it I decided to work with it. My mother who had been sleeping lightly asked if I was okay, and I told her I was starting to feel the contractions and wanted to walk again. We walked the halls together for about an hour, this time I had to stop every few minutes to collect myself because of the contractions. I used the up breathing to get through each contraction. When I got back in bed, my nurse brought me a peanut ball and I laid on my side with it between my legs. I occasionally switched sides hoping to cope with the intensity of the contractions. The contractions got more intense around 7am and I hung over the top of the bed and focused on breathing. Andrea also rocked my hips to get baby to move down. The hip rocking was almost more painful than the contractions. And my level of exhaustion was reaching the point of delirium. Occasionally I would drift off to sleep between contractions only to be woken up by another surge. Andrea asked me what my pain level was on a scale of 1 to 10 and joked that Malachi might make it in time for church. I told her I was at an 8. She said, "I know you want to go unmedicated but I have to ask if you want the epidural." I told her no. I was in and out of coherent consciousness and weak from the lack of sleep. At one point the contraction was so intense I threw up. I kept vacillating between hot and cold. Danny was at my side asking me what I needed without being overbearing. He massaged me to relieve the pressure and had wet rags for my brow when I felt hot. He fed me gatorade from a straw to get my electrolytes up and gave me cinnamon gum to spike my blood sugar, when he noticed I was weak. He had brought the eucalyptus essential oil from home and put it on key spots on the bed frame so I could sniff it when I felt myself fading, and he played calming ocean sounds, which helped me to focus my breathing and ride the wave of the contractions. Night shift turned to day, and I had the same nurse from the day before. Kay came back to check on me. Technically, her shift ended at 8am but she decided to stay and see me through to the end. I'm so glad she did! With my midwife Kay at my 6-week postpartum appointment. Around 11am I felt the urge to push, but apparently I wasn't quite ready yet. The urge went away. Around 12p Kay went around the room whispering to everyone that I was ready to push. My mom came and told me. I was hanging off the top of the bed again. I cried because I was tired and I didn't feel the urge to push anymore. I prayed, and asked Jesus to help me because no one else could have this baby for me. At some point Dr. Bootstaylor came into the room, but he stayed in a corner observing. He was there just in case. But the fetal monitor said everything was still fine. Baby's heart rate did not drop. I'm not sure the exact time I said I was ready to push. I still felt no urge. From the stories in the book I read, most of the women said they felt an urge to push and a lot of them said pushing was the easiest part and a welcomed relief. Some women even had the baby after 20 minutes of pushing or with "three good pushes." I'm not sure if I hit the 2 hour mark, but I know I pushed for more than an hour. I pushed in different positions—squatting on the bed, laying on my back, and laying on my side. My birth team encouraged me. They told me I was doing great, but after those first 45 minutes of pushing to no avail I felt like I had nothing left. Pushing was definitely NOT the easiest part. I kept telling my mom, "I'm so tired." At one point Danny said he saw the head, and that only made me cry. How was I gonna get this baby out!? I gave birth lying on my left side. Danny caught Malachi's head and gave him to Kay because once his head came out the rest of him slipped out too. From the time my water broke until the time Malachi was born was about 30 hours, I felt the contractions for 12 of those hours. By God's grace, I had done it. They gave him to me right away. I was dazed with exhaustion and awe that the human living inside of me was not outside with us. Danny cut the umbilical cord. Malachi latched on right away. Screenshot from video of Danny cutting the cord. I was out of it. Bikini top because I was planning/hoping for a water birth. I got to hold him for a good amount of time before a team cleaned him up and took his measurements. A healthy baby boy with ten fingers and ten toes. Malachi Daniel Jr. Findlay was born on Sunday, April 8 at 2:16 pm. He was 19 inches long and weighed 5 lbs. 3.5 oz. Our lives haven't been the same since! It's richer. More beautiful. Life is much more wonderful with him in the world. One of my favorite pictures of Malachi and daddy from that first week.